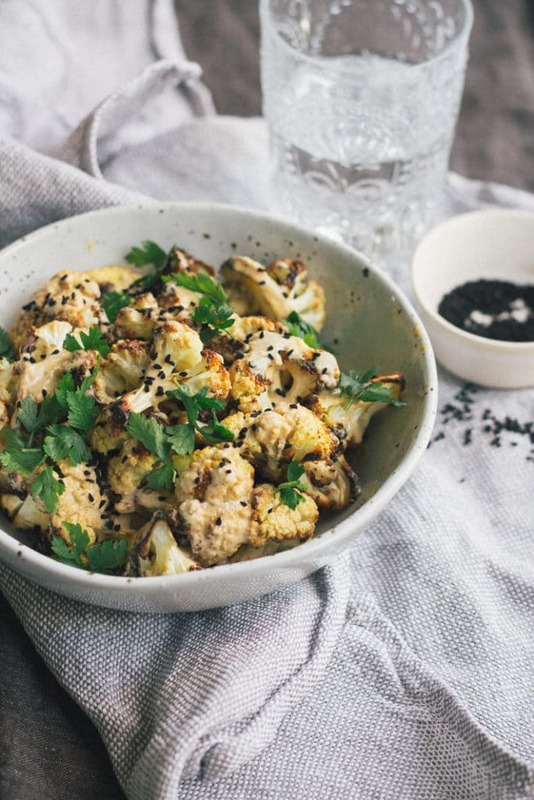 Are you obsessed with cauliflower like me? I can’t get enough. Roasted cauliflower. 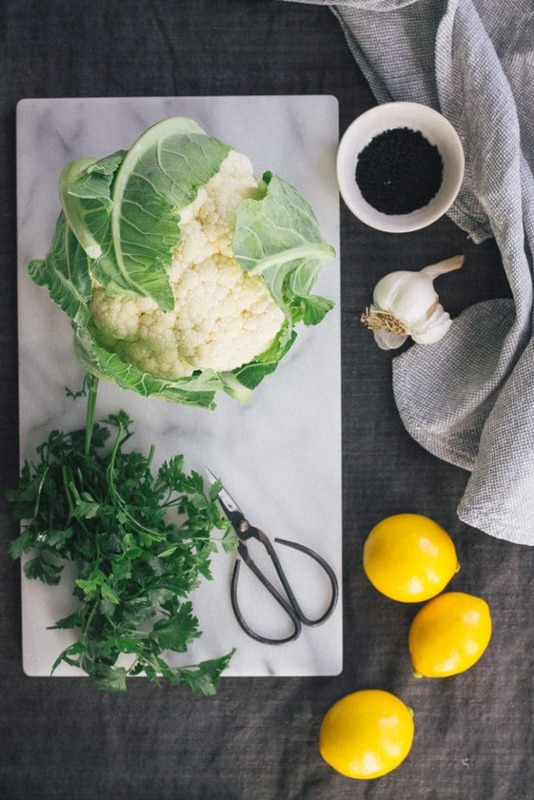 Pureed creamy cauliflower. Cheesy cauliflower gratin. Cauliflower pizzas. Cauliflower soup. I’m still working on liking cauliflower rice, but like most foods, give it time and I’ll come around. 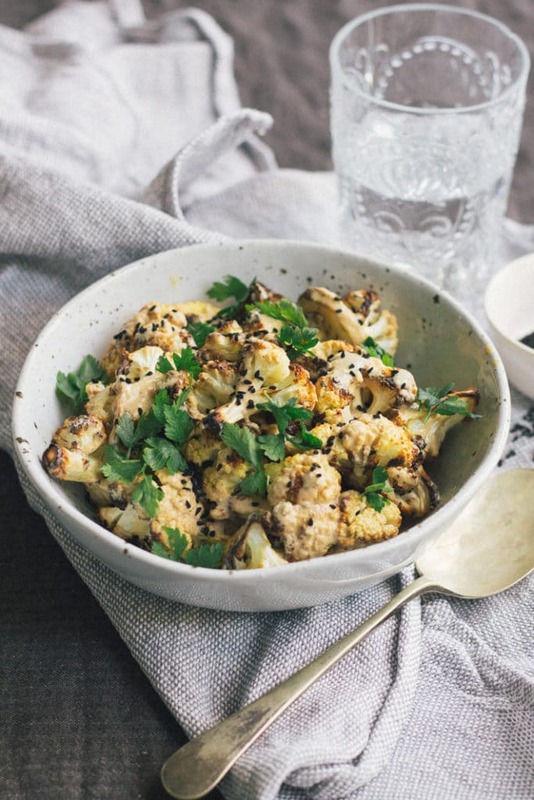 My absolute favourite: my Roasted Cauliflower with Tahini Sauce, of course! Not to mention that it’s amazingly good for you too. I lie. I actually can get enough cauliflower (I’m not talking about Roasted Cauliflower with Tahini Sauce, I can’t get enough of that). After my second son was born I was constantly looking for shortcuts on ways to feed my family. So I signed up for a delivery service that sends you a weekly menu and all the ingredients you need to make it. Anyone in New Zealand will instantly know what I’m talking about and I’m sure there’s plenty of companies like this all over the world. The ingredients and menu arrived on the Sunday night and I excitedly opened up my “gourmet” package and there was a huge, I mean gigantic cauliflower…and a few other ingredients. Maybe cauliflower was cheap that week? So that week my hubby and I proceeded to chew our way through meal after meal of cauliflower. Now I like cauliflower, so I was quite excited but I’ll tell you, by the end of that week I really couldn’t face that last meal of cauliflower rice. So yes, I can get enough cauliflower, I do have my cauliflower limits and after that week I decided that in a quest for a little variety in my meals I could find the time and energy to do my own shopping. I have never been to the Middle East, but it is definitely one place I would love to travel to. If nothing else, than to eat the food. The other night a few friends and I went to an Israeli restaurant called Ima here in Auckland. It was a really laid back cheap and cheerful place that had some really delicious food. It also surprisingly had Israeli wine on the menu. Sorry Israel, you make a mean hummus but I’m not sure about your wine. As part of the mezze platter to start I had the most delicious cauliflower. I think it had been deep fried then smothered in a tahini based sauce. I had to recreate this! I hate to deep fry at home, not because of the fat (don’t judge, I love deep fried food) but because of the fuss and the mess. So I decided to roast it. 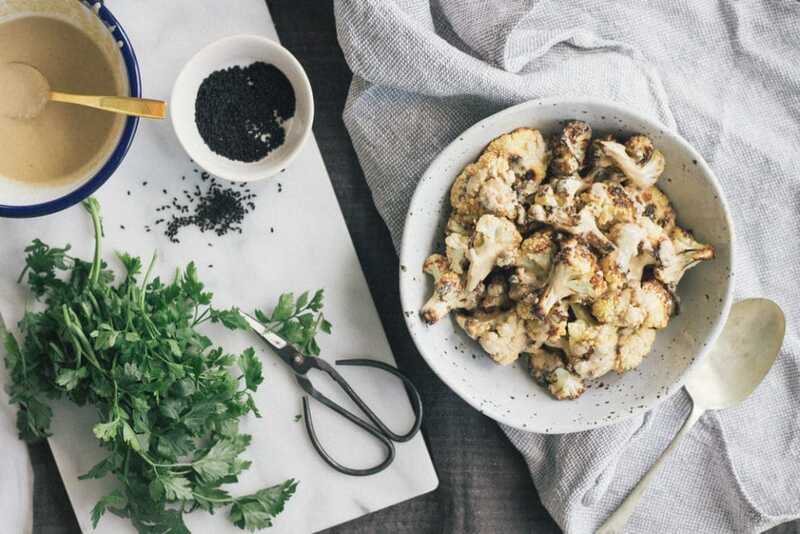 I’ve told you all before and I’m going to tell you again, if you haven’t tried roasted cauliflower then you have to try it today! Even cauliflower haters love it. So I’ve convinced you on the cauliflower, now let’s talk sauce. Creamy, smoky, nutty with a little zing from some lemon and of course we can’t forget the all important garlic hit. 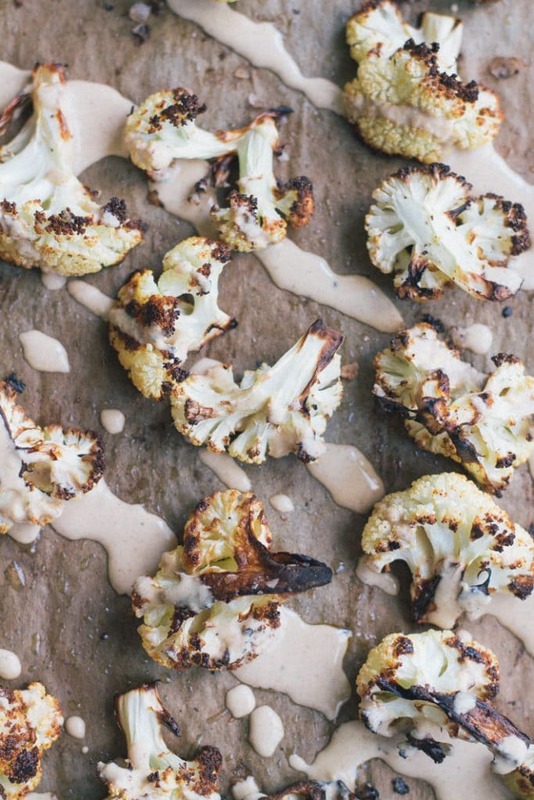 The tahini sauce is just made to be smothered all over that roasted cauliflower, but is so good that I always make extra and keep some in the fridge for dipping raw veggies, smothering on all sorts of roasted veggies or even just to have the occasional spoonful when I get a craving (again, don’t judge, we are all friends around here). So quick, so tasty and so easy. Perfect alongside any grilled meat or seafood or even better, next to some salty halloumi for a meat-free meal. By the way, I tweeted my photography style a little today. What do you think? I would love to hear your thoughts! Preheat oven to 240/460F on fan bake. 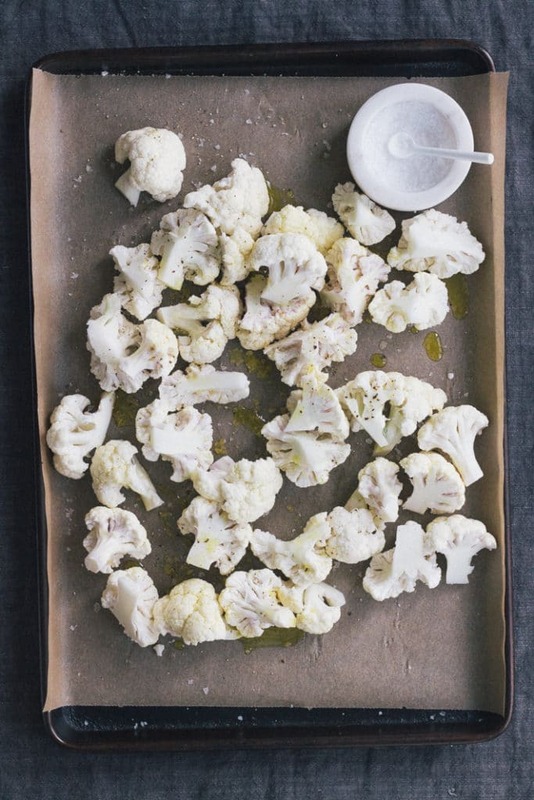 Scatter cauliflower florets on a baking tray. Drizzle over olive oil and season with 1/2 tsp sea salt and 1/2 tsp cracked black pepper. Toss to coat the cauliflower then arrange in a single layer on the baking tray. If you need to use 2 baking trays to ensure they are in a single layer then do this. 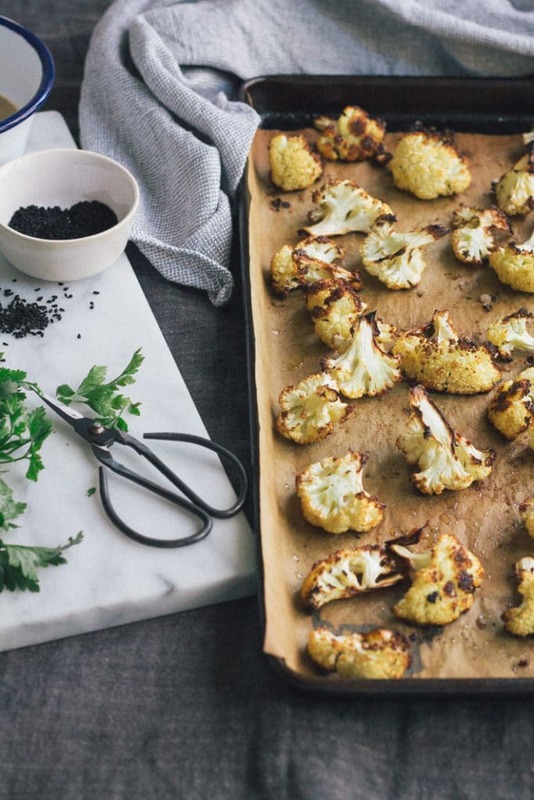 Bake cauliflower for 20-25 min or until it is tender and browning. Ensure that you toss the cauliflower and rotate it once during cooking. 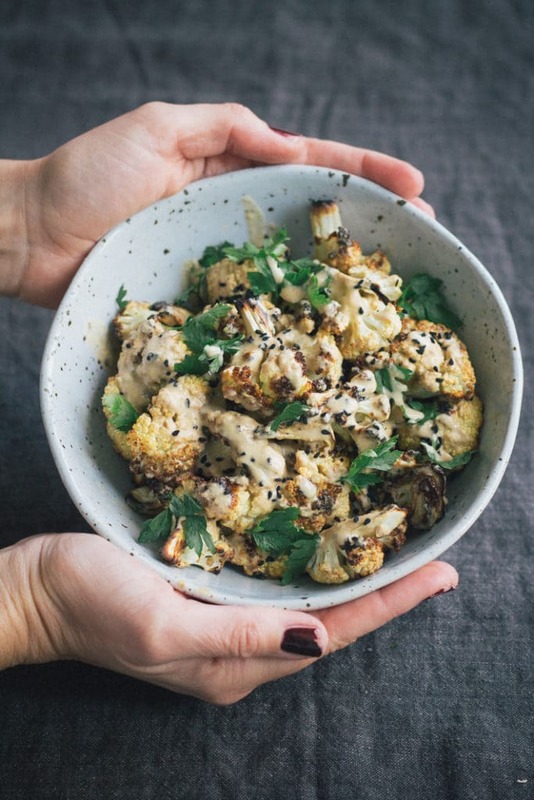 While the cauliflower is cooking, make the tahini dressing. 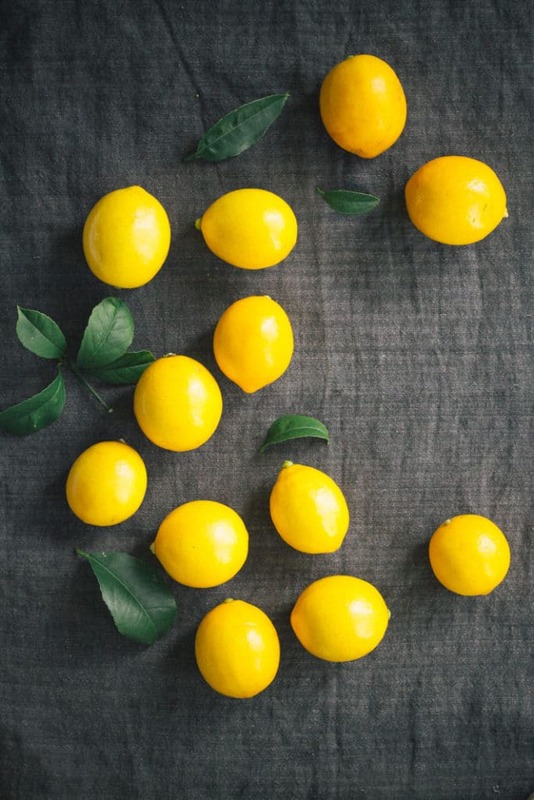 In a small bowl combine tahini, water, lemon juice and garlic. Season with 1/2 tsp sea salt and 1/2 tsp cracked black pepper. 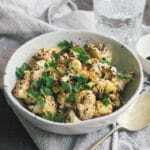 Remove cauliflower from oven, drizzle or toss with dressing, scatter over parsley and/or coriander (cilantro) and nigella seeds and serve. Made this last night and it was fantastic! Tweaked it slightly as my tahini was a little bitter so added a tsp of maple syrup (as we Canadians do ;). And also roasted a few handfuls of chickpeas for the last few minutes of roasting the cauliflower, in the hopes of bulking it up so that I would have some leftovers for lunch the next day. Used some pea shoots I had and the parsley to garnish. Will definitely be making this regularly. Thank you so much for coming back to comment Michelle (& Will). I love that you liked the cauliflower dish and I absolutely love what you’ve done to the recipe. I must say, when My Little Larder hits it out of the park (ha!) and I can afford a recipe developer, I’m hiring you! Making this again tonight- have been craving it since I made it last. Cheers to the success of My Little Larder.! !